Saturday, January 17, 1835.Vandalia, IL. Lincoln presents petition of citizens of "counties of Sangamon, Morgan, and Tazewell, praying the organization of a new county out of said counties." On his motion petition is referred to Committee on Petitions. He votes nay on motion to table until July 4, 1835 "act, concerning county commissioners." He introduces amendment to bill concerning marks and brands.House Journal; Amendment to a Bill Concerning Marks and Brands, [17 January 1835], CW, 1:33. Tuesday, January 17, 1837.Vandalia, IL. Resolution of Carpenter of Hamilton "that no business shall be received in either House after Monday the 6th of February; and that the General Assembly adjourn sine die on Thursday the 16th of February next" is tabled 51 to 26, Lincoln voting yea.House Journal. Wednesday, January 17, 1838.Springfield, IL. ["Being unexpectedly called from home . . . likely to detain me until a week previous to our next court, I take this method of informing those who have confided their business to . . . Walker & Hewett that whenever not adversely employed, either Messrs. Logan & Baker or Messrs. Stuart & Lincoln will give advice or assistance needed during my absence. J. Hewett. "Sangamo Journal, 20 January 1838. Thursday, January 17, 1839.Vandalia, IL. Lincoln reports from Finance Committee plan to pay for internal improvements. Federal government should sell to state 20,000,000 acres of public lands at 25¢ an acre. State would borrow money to buy land and resell it at $1.25 an acre. Report is tabled. Lincoln enters debate on "partiality" in federal government's handling of tax money collected in Illinois.House Journal; Photocopy; Remarks in Illinois Legislature Concerning Resolutions in Relation to Purchase of Public Lands, 17 January 1839, CW, 1:132-34. Friday, January 17, 1840.Springfield, IL. Lincoln votes seven times in favor of continuing some form of internal improvement, although it is obvious that House majority has lost faith in extensive system adopted in 1837.House Journal. Monday, January 17, 1842.Springfield, IL. Benedict v. Dellehunt is argued by Lamborn for appellant and Lincoln for appellee. Court affirms judgment of lower court. In Hawks v. Lands, appeal from McLean, Jesse B. Thomas, attorney for defendant in error, moves appeal be dismissed, appellant having failed to file record. Lincoln appears for plaintiff in error.Record. Tuesday, January 17, 1843.Springfield, IL. James A. McDougall, attorney general, moves peremptory mandamus in People ex rel. McGoon v. Browne (SC). Lincoln and Scammon appear for Thomas C. Browne.Record. Monday, January 17, 1848.Washington, DC. Seizure of African-American waiter in Washington by three slave traders induces Joshua Giddings to introduce resolution to investigate slave trade in District or removing capital to free state. Lincoln votes against motion to table, but it passes. He votes in favor of resolution declaring it inexpedient to order our troops in Mexico to fall back. Globe. Wednesday, January 17, 1849.Washington, DC. Lincoln's name is not on list of absentees, so he must have attended House. Journal. Thursday, January 17, 1850.Springfield, IL. Lincoln continues argument on behalf of appellees in Moffett v. Lewis & Johnson. Logan concludes arguments in the case on behalf of the appellant. The case involves the right of business partner, Lewis, to compensation for selling patent rights to a churn. At trial, the Sangamon County Circuit Court awarded Lewis $1,000 and ordered him to turn over $1,377.41 to another business partner, Moffett. Lewis appealed the case to the Illinois Supreme Court. Record. Friday, January 17, 1851.Springfield, IL. Supreme Court hands down opinions in five Lincoln & Herndon cases. They lose Webster & Huntington v. French et al., and Majors v. Hawks, Osborn & Co.. They win Penny v. Graves, McHenry v. Watkins, and Enos et al. v. Capps. Record; 12 Ill., 302, 298, 287, 233, 255. Monday, January 17, 1853.Springfield, IL. Tuesday, January 17, 1854.Springfield, IL. Higgins case occupies Supreme Court entire day. In morning Lincoln presents case of defendant, and is followed by Edwards for plaintiff. Court takes case under advisement, and later reverses circuit court decision. Record; 15 Ill. 110. Thursday, January 17, 1856.Springfield, IL. Logan continues argument in Illinois Central case. James F. Joy, for railroad, concludes argument and submits case. Court takes it under advisement. Record. Tuesday, January 17, 1860.Springfield, IL. Gill et al. v. Hoblit, involving technical defect in summons, comes up in Supreme Court. Lincoln argues and submits case for defendant, and court later orders remand. Record; 23 Ill. 473-75. Thursday, January 17, 1861.Springfield, IL. Lincoln announces selection of Judge Edward Bates of Missouri and Senator William H. Seward (N.Y.) for cabinet. No further selections will be made until he arrives in Washington. Evening Star (Washington, DC), 17 January 1861, 2:1. Friday, January 17, 1862.Washington, DC. In morning Lincoln consults with Edwards Pierrepont, former superior court judge of City of New York. Pierrepont to Lincoln, 19 January 1862, John G. Nicolay Papers, Library of Congress, Washington, DC. In afternoon discusses with Gen. James H. Lane surrender of fugitives to loyal owners. Report of W. A. Croffut to N.Y. Tribune, John G. Nicolay Papers, Library of Congress, Washington, DC. Atty. Gen. Bates confers with Lincoln and delivers papers relating to Wheeler pardon case. Bates to Washburne, 17 January 1862, Elihu B. Washburne Papers, Library of Congress, Washington DC. The Chevalier Bertinatti, minister resident of Italy, calls and presents communication from King Victor Emmanuel. Seward to Lincoln, 16 January 1862, Abraham Lincoln Papers, Library of Congress, Washington, DC. Lincoln transmits to Senate petition of certain members of Potawatomi tribe of Indians complaining about treaty made on November 15, 1862 last. Abraham Lincoln to the Senate, 17 January 1862, CW, 5:101-2. Sends to Congress documentation exchanged with Prussia regarding "Trent" affair. Abraham Lincoln to the Senate and House of Representatives, 17 January 1862, CW, 5:102. Saturday, January 17, 1863.Washington, DC. In morning Lincoln discusses state of Union with Horace Greeley, then interviews Capt. James M. Rice accompanied by former Sen. O. H. Browning (Ill.), Washington attorney. Browning, Diary. 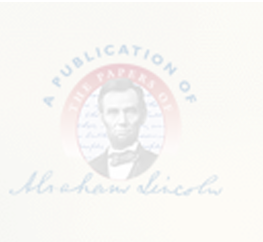 Lincoln signs a resolution that Congress passed concerning military pay. The resolution allows the treasury secretary to "make an additional issue of one hundred millions of dollars . . . for the payment of the army and navy." Lincoln seeks a "prompt discharge of all arrears of pay due to our soldiers and our sailors." He takes the opportunity to address the over-issuance of government and bank notes. Lincoln explains, "A judicious measure to prevent the deterioration of this currency, by a reasonable taxation of bank circulation or otherwise is needed." Abraham Lincoln to the Senate and House of Representatives, 17 January 1863, CW, 6:60-62. Mrs. Lincoln holds Saturday afternoon reception. Fox, Diary, Gist-Blair Family Papers, Library of Congress, Washington, DC. Sunday, January 17, 1864.Washington, DC. President interviews E. Graham Haight and mother in evening. Haight to Lincoln, 17 January 1864, Abraham Lincoln Papers, Library of Congress, Washington, DC. Assures Gov. Bramlette (Ky.) that Gen. Grant was aware of order moving troops from Kentucky to Knoxville. Abraham Lincoln to Thomas E. Bramlette, 17 January 1864, CW, 7:134-35.